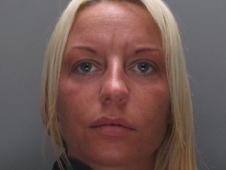 A Merseyside woman who fatally stabbed a mother-of-two after years of falling out has been jailed for life for murder at Liverpool Crown Court. Louise Gardner, 26, of Mallow Road, Kensington, stabbed Rachel Jones 14 times on Woodville Terrace, Anfield, on 14 March 2008, the court heard. Gardner had admitted killing Miss Jones but claimed she was provoked. Jailing her for at least 16 years, Judge Gerald Clifton said Gardner had "shown not a particle of remorse". "You have ended the life of a young woman and deprived two very young children of their mother." Liverpool Crown Court was told how Miss Jones had earlier thrown something at a window at Miss Gardner's mother's house, causing it to smash. The court heard that Gardner had followed her victim in a car, and when she caught up she shouted: "I'm going to kill you," before stabbing her and breaking her jaw. Two stab wounds penetrated Miss Jones's heart, the court was told. Gardner left her victim unconscious on the ground and fled the scene while paramedics took Miss Jones to hospital where she was pronounced dead. She then dumped the knife down a drain and later told police Miss Jones was carrying it but had dropped it during the confrontation. The jury heard there had been a dispute between Miss Jones and members of the Gardner family, which started some years before after Miss Jones' house had been damaged during a party when she had been away. Prosecutor Stuart Driver QC told the court the dispute could have been going on for "as long as seven years" and Miss Jones had "always blamed" Louise Gardner's sister following the damage. Following the sentencing, Det Ch Insp Richie Davies said: "This was an extremely brutal and sustained attack which resulted in Rachel suffering horrific injuries which led to her death. "Louise Gardner carried out this brutal attack on a residential street in front of a group of young people, some of whom have had to have counselling. This terrible attack and the injuries they witnessed will live with them for a long time."